• Ankle Foot Orthotics (AFO’s) prolong the repositioning of the foot with CP which decreases the strength of abnormally strong tonic foot flexors. • AFO’s hold the ankle in a stable position and provide a stable base of support for the lower extremities. The therapist can then improve mobility at the pelvis and trunk. This is thought to assist in weight shift over the lower extremities in preparation for standing and independent walking. • AFO’s provide a stable position of the foot and ankle, enhancing standing and walking through the proprioceptive responses of weight bearing. • The primary indication for AFO’s is when an ability to normalize patterns and change tone is present in therapy but cannot be maintained. • Other indications are to prevent foot contractures, deformities and pain. There are many reasons for treating foot and ankle disorders with orthosis (braces). Any disorder that results in a muscle or ligamentous imbalance or weakness will cause physical or structural deformity. This can be the result of neurological problems such as CVA (stroke) or Multiple Sclerosis or the result of trauma. How does an AFO work? requires an extremely accurate fit of the brace to the client. Just as you would expect, continuing adjustment of the AFO when function change is an important part of the treatment. What is necessary to get AFO’s? orthotic evaluation is the second step. What is an Orthotic Evaluation? As Orthotists we are looking at the degree of deformity, how much of the deformity is fixed, how much is flexible, and the condition of the area that will receive the pressure applied by the AFO. In addition, the size of the client, his or her overall physical condition, secondary pathologies, cognitive abilities, age, family support and needs, all play an important part in the design of each brace. In some cases it may be obvious that a series of braces will be necessary to bring a client to his or her best potential position. In other cases it is impossible to accurately predict the degree of correction a client will achieve until the first set of braces is applied. 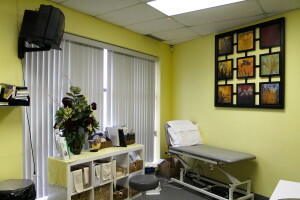 The evaluation is an on-going part of our treatment. Following the evaluation, a plaster impression is obtained. In many cases it is difficult or impossible for the client to hold as steady as we require during this procedure. When this is the case, the laboratory time is increased substantially in order to achieve and accurate fit. After the plaster impression is taken, it is reinforced and sealed to prepare it for filling. The prepared impression is filled with a mixture of plaster of Paris and water. In addition, a mandrel is inserted in the cast to provide a handle while we are working on the model. Once the mixture has set, the plaster bandage that made up the impression is stripped off and discarded, leaving us with an accurate model of the client’s leg and foot. This model is modified to apply the proper corrective pressures to the client’s leg and foot. It is at this time that the basic design and effectiveness of each brace is determined. While all finished ankle foot orthosis look similar, each one is highly individual because of the modifications necessary to apply the precise corrective pressure each client requires. When is the AFO actually made? Once the modifications are completed the model is smoothed and prepared for vacuum forming. A vacuum interface is applied to the model and the proper plastic is selected and cut to correct dimensions for forming. The type and thickness of plastic used is based on the requirements of the individual client. This plastic is heated in an infrared oven until it reaches its liquid state. At this time it is stretched over the model, sealed and vacuum applied. This vacuum is maintained until the plastic has set. The orthosis must remain undisturbed for 24 hours to allow the stresses in the plastic to normalize. At this time the rough form of the client’s brace has been completed. When the plastic has set, it is removed from the model. The outline and exact shape required is trimmed from the plastic. One the trimming is complete the edges of the orthosis are shaped to allow the brace to fit comfortably inside a child’s shoe. They are then finished by buffing and heating. The strapping system is designed, fabricated and attached, The AFO is ready for the initial fitting to the child. Why is there a fitting? The correction of the position of the foot is a complex process. Due to the nature of obtaining a plaster impression form most children, and there can be day to day changes in tone, we expect to adjust the orthosis to accommodate these small, but important, differences between the time the impression was taken and the time of application. Each child’s requirements are unique. 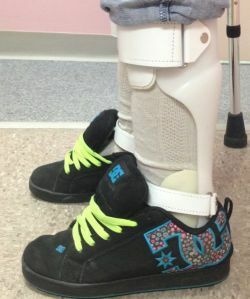 If the change is dramatic, it may be necessary to reform the orthosis or start with a new cast. How often will the Orthotist need to see my child? After being fitted with the braces follow-up for your child is scheduled on an individual basis and the amount of post application care required varies. The normal spacing of these follow-up appointments is: two weeks post-application, and every three months thereafter. Any special requirements your child has will change these visits. Every patient presents new challenges and is unique. Any time is the right time to ask questions. For your peace of mind, please contact us immediately at (519) 850-4721.